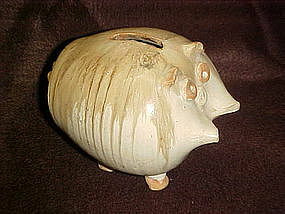 A very odd and artsy pig bank made of pottery with a drip glaze. Made and Signed by Jack Pott, of Jack Pott Ceramics of San Diego California. Sticker still intact. Measures 5" tall and is in perfect condition.